Watch Ya’ Mouth is the AUTHENTIC, Hilarious, Mouthguard Party Game. Originated in viral videos, Launched on Kickstarter, and now on Amazon just for you! In this laughter-inducing, competitive card-based game, teams of players, hampered by cheek retractors, attempt to read and interpret/speak out phrases and…. Hilarity ensues! 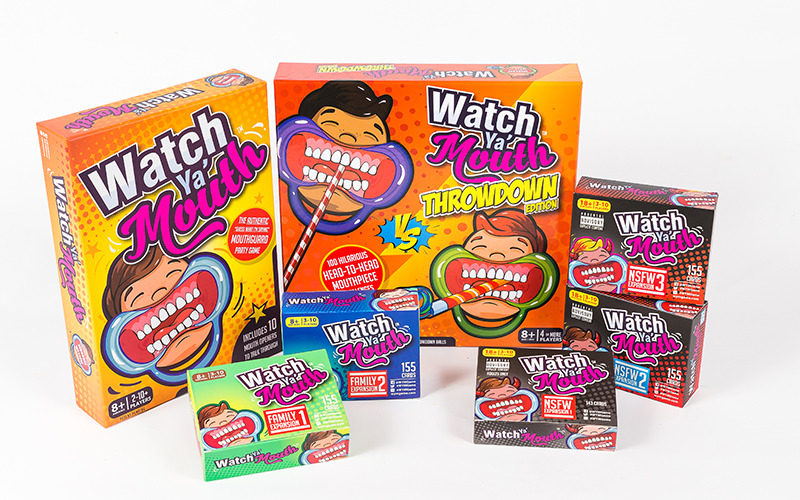 Good for Ages 8+, with virtually unlimited players (when played using our “Alternate” rule set), Watch Ya’ Mouth is a must for any gathering, party, game night, or family night. Our mouthpieces are FDA and CE certified, our cards are thick and durable, and our community is second to none. With a variety of phrase packs available, ranging from Family-Safe to Adult-Only, there’s something for everyone. Be warned: Stomach-Cramping, Eye-Watering laughter is a very frequent occurrence. “One of the funniest party games there’s been” Learn it in seconds, play it for hours, and create lasting memories with your friends and family. We’re a small, independent, and extremely hard working team whose mission is to make you laugh. Join us, and welcome to the party! Watch Ya’ Mouth – THROWDOWN is the outrageous mouthguard party game that pits you against your friends in a head-to-head competition of skill and audacity! A companion to the AUTHENTIC Watch Ya’ Mouth game, “THROWDOWN” goes beyond simply attempting to read and interpret phrases, and encourages players to compete in over 100 unique challenges to perform while hampered by cheek retractors. Lucky winners will also win a full set of expansion packs!